Home » Featured Products » Gifts & Gift Sets » Prairie Gifts » Holiday Cards - O Pioneers! 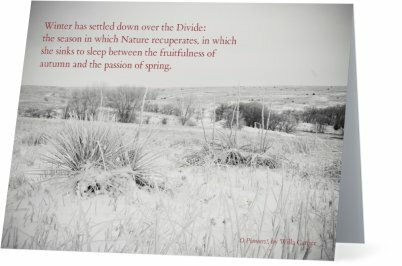 This prairie Christmas Card is the perfect way to celebrate the winter holidays. The image of the front perfectly captures the desolate, yet beautiful mystique of the prairie.